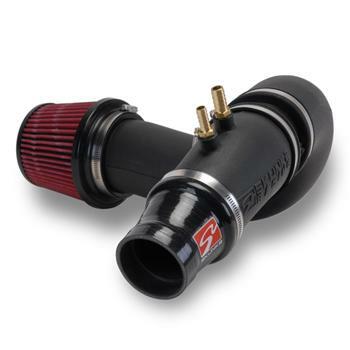 Skunk2 Cold Air Intake UNIVERSAL - MiataRoadster - Stay tuned with MiataRoadster! Diameter 3 x 3.5in I.D. Skunk2 drew upon its experience and longstanding technical partnership with championship-winning Compass360 Racing when developing its all-new Cold-Air Intake for the ’06-’11 Civic Si. The results are the best performing, best fitting intake system available. Skunk2’s Cold-Air Intake is manufactured from molded polymer plastic for superior intake air insulation when compared to aluminum as well as for a smooth, continuous taper. When compared to aluminum, the thicker polymer material results in a superior thermal barrier and lower intake air temperatures. Each kit includes a 3.5-inch internal diameter lower tube and a tapered, 3.5-inch to 3.0-inch internal diameter upper tube that connects to the factory throttle body with a high-quality, silicone connector (larger diameter connectors for use with Skunk2 throttle bodies or similar sold separately). The two piece design and supplied MAF sensor adapter allows for compatibility with vehicles utilizing the factory ECU. A silicone coupler featuring a smooth, tapered transition between the two tubes is also included for vehicles equipped with aftermarket engine management systems that don’t utilize MAF sensors. Each Cold-Air Intake kit includes relocation hardware for the battery, ECU, fuse box, and cooling system reservoir tank as well as high-quality stainless steel clamps and mounting hardware. Unlike other intake systems, only Skunk2’s unique design and brackets allow for the OEM battery to be retained. A specially shaped, silicone upper radiator hose is also included with each kit to ensure maximum clearance for the intake tubing and proper fitment. Skunk2 developed its unique Cold-Air Intake system in 2009 for back-to-back Grand-Am champions and racing partners Compass360 Racing. Now that the team is retiring its eighth-generation Civic race cars, we can finally release this race-proven technology to enthusiasts.